Statistics Canada maintains a wealth of data on Canada’s population. In the 13 jurisdictions — 10 provinces and 3 territories — departments or ministries of education are responsible for the organization, delivery, and assessment of education at the elementary and secondary levels, for technical and vocational education, and for postsecondary education. Some jurisdictions have separate departments or ministries, one having responsibility for elementary-secondary education and another for postsecondary education and skills training. An increasing number of jurisdictions have placed early childhood learning and development under the umbrella of education. While there are a great many similarities in the provincial and territorial education systems across Canada, there are significant differences in curriculum, assessment, and accountability policies among the jurisdictions that express the geography, history, language, culture, and corresponding specialized needs of the populations served. The comprehensive, diversified, and widely accessible nature of the education systems in Canada reflects the societal belief in the importance of education. Public expenditure was 82.3 per cent of the total, with private spending at 17.7 per cent. The following chart illustrates the structure of the educational system in each jurisdiction at the elementary, secondary, and postsecondary levels. Click on graphic to display full sized printable copy. 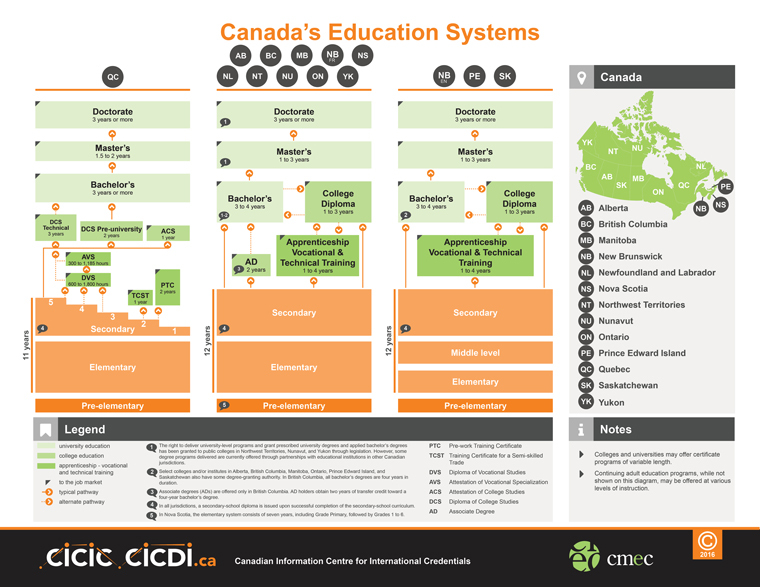 CICIC has a wealth of information about provincial and territorial education systems. Public education is provided free to all Canadians who meet various age and residence requirements. Each province and territory has one or two departments/ministries responsible for education, headed by a minister who is almost always an elected member of the legislature and appointed to the position by the government leader of the jurisdiction. Deputy ministers, who belong to the civil service, are responsible for the operation of the departments. The ministries and departments provide educational, administrative, and financial management and school support functions, and they define both the educational services to be provided and the policy and legislative frameworks for education in the jurisdiction. Local governance of education is usually entrusted to school boards, school districts, school divisions, or district education councils. Their members are elected by public ballot. The power delegated to the local authorities is at the discretion of the provincial and territorial governments and generally consists of the operation and administration (including financial) of the group of schools within their board or division, curriculum implementation, responsibility for personnel, enrolment of students, and initiation of proposals for new construction or other major capital expenditures. In 2004–05, provinces and territories reported that there were 5.3 million students enrolled in public elementary and secondary schools. Canada is a bilingual country, and the constitution recognizes French and English as its two official languages. According to the 2006 Census, more than 85 per cent of French-mother- tongue Canadians live in the province of Quebec: the minority language rights of French-speaking students living outside the province of Quebec and English-speaking students living in the province of Quebec are protected in the Canadian Charter of Rights and Freedoms. The Charter defines the conditions under which Canadians have the right to access publicly funded education in either minority language. Each province and territory has established French-language school boards to manage the French-first-language schools. In the province of Quebec, the same structure applies to education in English-first-language schools. Public funding for education comes either directly from the provincial or territorial government or through a mix of provincial transfers and local taxes collected either by the local government or by the boards with taxing powers. Provincial and territorial regulations, revised yearly, provide the grant structure that sets the level of funding for each school board based on factors such as the number of students, special needs, and location. In 2004-05, Canada's elementary and secondary school systems employed close to 310,000 educators, most of whom had four or five years of postsecondary study. These educators are primarily teachers, but principals, vice-principals, and professional non-teaching staff such as consultants and counselors are also included. They are licensed by the provincial and territorial departments or ministries of education. Most secondary school teachers have a subject specialization in the courses they teach. Every jurisdiction provides Kindergarten programs, whether full-day or half-day, mandatory or voluntary. Eight jurisdictions provide full-day Kindergarten for all five-year-olds. In 2014, CMEC released the CMEC Early Learning and Development Framework which presents a pan-Canadian vision for early learning that can be adapted to the unique needs and circumstances of each province and territory. The ages for compulsory schooling vary from one jurisdiction to another, but most require attendance in school from age 6 to age 16. In some cases, compulsory schooling starts at 5, and in others it extends to age 18 or graduation from secondary school. In most jurisdictions, elementary schools cover six to eight years of schooling. Almost 98 per cent of elementary students go on to the secondary level. The elementary school curriculum emphasizes the basic subjects of language, mathematics, social studies, science, health and physical education, and introductory arts; some jurisdictions include second-language learning. In many provinces and territories, increased attention is being paid to literacy, especially in the case of boys, as test results have shown that their performance is falling behind that of girls in language. Secondary school covers the final four to six years of compulsory education. The secondary school graduation rate in 2003 was 74 per cent, with 78 per cent of girls and 70 per cent of boys graduating. The overall graduation rate has remained relatively stable while the longer-term dropout rate has declined as older students complete their secondary education. In 2004–05, the dropout rate (defined as 20- to 24-year-olds without a secondary school diploma and not in school) had fallen to 10 per cent. In the first years, students take mostly compulsory courses, with some options. The proportion of options increases in the later years so that students may take specialized courses to prepare for the job market or to meet the differing entrance requirements of postsecondary institutions. Secondary school diplomas are awarded to students who complete the requisite number of compulsory and optional courses. In most cases, vocational and academic programs are offered within the same secondary schools; in others, technical and vocational programs are offered in separate, dedicated vocational training centres. For students with an interest in a specific trade, programs varying in length from less than one year to three years are offered, many of them leading to diplomas and certificates. The legislation and practices concerning the establishment of separate educational systems and private educational institutions vary from jurisdiction to jurisdiction. Three jurisdictions provide for tax-supported separate school systems that include both elementary and secondary education. These separate school systems reflect the constitutionally protected right to religious education for Roman Catholics or Protestants, when either group is the religious minority in a community. Public and separate school systems that are publicly funded serve about 93 per cent of all students in Canada. Six jurisdictions provide partial funding for private schools if certain criteria, which vary among jurisdictions, are met. No funding for private schools is provided in the other jurisdictions, although they still may be regulated. Postsecondary education is available in both government-supported and private institutions, which offer degrees, diplomas, certificates, and attestations depending on the nature of the institution and the length of the program. The postsecondary environment has evolved during the past few years, as universities are no longer the only degree-granting institutions in some jurisdictions. A recognized postsecondary institution is a private or public institution that has been given full authority to grant degrees, diplomas, and other credentials by a public or private act of the provincial or territorial legislature or through a government-mandated quality assurance mechanism. Canada has 163 recognized public and private universities (including theological schools) and 183 recognized public colleges and institutes, including those granting applied and bachelor's degrees. In addition to the recognized institutions, there are 68 university-level institutions and 51 college-level ones operating as authorized institutions, at which only selected programs are approved under provincially established quality assurance programs. Tuition costs at universities averaged $4,524 in 2007–08, with international student fees for an undergraduate program averaging about $14,000 annually. At colleges and institutes (in the nine provinces outside Quebec), the average tuition was about $2,400 (Quebec residents do not pay college tuition). Education is also funded through the money that governments transfer to individual students through loans, grants, and education tax credits. Participation in postsecondary education has grown significantly in the past few years, whether measured by numbers of enrolments or by the proportion of the population in any given age group who are attending college or university. While women continue to make up the majority of students on both university and college campuses, they are still in the minority in the skilled trades. University Attendance and Graduation According to Universities Canada, in 2005, there were 806,000 full-time university students (an increase of nearly 150,000 in the previous four years), as well as 273,000 part-time students. In 2005, Canadian universities awarded an estimated 175,700 bachelor's degrees, 33,000 master's degrees, and 4,200 doctoral degrees. Publicly funded universities are largely autonomous; they set their own admissions standards and degree requirements and have considerable flexibility in the management of their financial affairs and program offerings. Government intervention is generally limited to funding, fee structures, and the introduction of new programs. Most Canadian universities have a two-tiered system of governance that includes a board of governors and a senate. Boards are generally charged with overall financial and policy concerns. Academic senates are responsible for programs, courses, admission requirements, qualifications for degrees, and academic planning. Their decisions are subject to board approval. Students are often represented on both bodies, as are alumni and representatives from the community at large. The majority of degree-granting institutions in Canada focus on teaching and research. In 2004–05, Canadian universities performed $8.9 billion worth of research and development, close to 35 per cent of the national total. Teaching is the other key function, whether at the small liberal arts universities that grant only undergraduate degrees or at the large, comprehensive institutions. Registration varies from about 2,000 students at some institutions to a full-time enrolment of over 62,000 at the University of Toronto, Canada's largest English-language university. There are more than 10,000 undergraduate and graduate degree programs offered in Canadian universities, as well as professional degree programs and certificates. Most institutions provide instruction in either English or French; others offer instruction in both official languages. In 2005, Canadian universities employed close to 40,000 full-time faculty members. Students enter at the bachelor's level after having successfully completed secondary school or the two-year cégep program in Quebec. Most universities also have special entrance requirements and paths for mature students. Bachelor's degrees normally require three or four years of full-time study, depending on the province and whether the program is general or specialized. A master's degree typically requires two years of study after the bachelor's degree. For a doctoral degree, three to five years of additional study and research plus a dissertation are the normal requirements. The Canadian Degree Qualifications Framework outlines the degree levels in more detail. In regulated professions, such as medicine, law, education, and social work, an internship is generally required in order to obtain a licence to practise. Colleges and Institutes Canada has reported that, in 2004–05, full-time public college and institute enrolment was almost 515,000 students in credit programs. Including both full- and part-time students, there were about one million students in credit programs and about 500,000 in non-credit programs. Just over 173,000 students graduated from public colleges and institutes in 2004–05. In publicly-funded colleges and institutes, government involvement can extend to admissions policies, program approval, curricula, institutional planning, and working conditions. Most colleges have boards of governors appointed by the provincial or territorial government, with representation from the public, students, and instructors. Program planning incorporates input from business, industry, and labour representatives on college advisory committees. There are thousands of public and private colleges and institutes in Canada. Of these, over 150 are recognized public colleges and institutes. These educational institutions may be called public colleges, specialized institutes, community colleges, institutes of technology, colleges of applied arts and technology, or cégeps. The private colleges are most often called career colleges. Colleges and institutes offer a range of vocation-oriented programs in a wide variety of professional and technical fields, including business, health, applied arts, technology, and social services. Some of the institutions are specialized and provide training in a single field such as fisheries, arts, paramedical technology, and agriculture. Colleges also provide literacy and academic upgrading programs, pre-employment and pre-apprenticeship programs, and the in-class portions of registered apprenticeship programs. As well, many different workshops, short programs, and upgrades for skilled workers and professionals are made available. Diplomas are generally awarded for successful completion of two- and three-year college and institute programs, while certificate programs usually take up to one year. University degrees and applied degrees are offered in some colleges and institutes, and others provide university transfer programs. Les collèges d'enseignement général et professionnel (cégeps) in Quebec offer a choice of two-year academic programs that are prerequisite for university study or three-year technical programs that prepare students for the labour market or for further postsecondary study. Colleges work very closely with business, industry, labour, and the public service sectors in the provision of professional development services and specialized programs and, on a wider basis, with their communities to design programs reflecting local needs. About 80 per cent of colleges also recognize prior learning assessment and recognition (PLAR) in at least some of their programs. Some universities also recognize it, and a growing number of provinces offer PLAR to adults at the secondary school level. PLAR is a process that helps adults demonstrate and gain recognition for learning they have acquired outside of formal education settings. Vocational education refers to a multi-year program or a series of courses providing specialized instruction in a skill or a trade intending to lead the student directly into a career or program based on that skill or trade. It is offered in secondary schools and at the postsecondary level in public colleges and institutes, private for-profit colleges, and in the workplace, through apprenticeship programs. At the secondary level, vocational programs may be offered at separate, specialized schools or as optional programs in schools offering both academic and vocational streams. The secondary school programs prepare the student for the workforce, a postsecondary program, or an apprenticeship. The role of public colleges has been described above. Private colleges may be licensed by provincial governments or may operate as unlicensed entities. They may receive some public funding but are largely funded through tuition fees and offer programs in such areas as business, health sciences, human services, applied arts, information technology, electronics, services, and trades. Programs usually require one or two years of study, although some private career colleges offer programs of shorter duration. Apprenticeship programs in Canada have been generally geared toward adults, with youth becoming increasingly involved in some jurisdictions. The related industry is responsible for the practical training, delivered in the workplace, and the educational institution provides the theoretical components. Apprenticeship registrations have shown a steady increase, reaching almost 300,000 in 2005. The largest increases have been in the building construction trades. Many institutions, governments, and groups are involved in the delivery of adult education and skills training programs, with the providers varying by jurisdiction. Colleges offer adult education and skills training for the labour force; government departments responsible for literacy, skills training, second-language learning, and other adult programs may provide programs themselves or fund both formal and non-formal educational bodies to develop and deliver the programs. Some jurisdictions have established dedicated adult learning centres. Community-based, not-for-profit, and voluntary organizations, school boards, and some private companies, largely funded by the provincial, territorial, or federal governments, address literacy and other learning needs for all adults, with some of them focusing on specific groups such as rural populations, the Indigenous communities, immigrants, displaced workers, and those with low levels of literacy or education. The federal government works with the provincial and territorial governments to fund many of the skills training and English and French second- language programs. The Programme for the International Assessment of Adult Competencies (PIAAC), 2012, revealed that Canadians were among the most equipped with the new skills demanded in the 21st century. Canada also had one of the most skilled and educated labour forces in the OECD. However, several sub-groups of the population had disproportionately low levels of proficiency in literacy, numeracy, and problem solving in technology-rich environments, most notably individuals who had not completed high school, immigrants, and Indigenous people. The federal government of Canada provides financial support for postsecondary education and the teaching of the two official languages. In addition, the federal government is responsible for the education of Indigenous Canadians on reserve, personnel in the armed forces and the coast guard, and inmates in federal correctional facilities. The federal government shares responsibility with First Nations for the provision of education to children ordinarily resident on reserve and attending provincial, federal, or band-operated schools. In 2006-07, Indian and Northern Affairs Canada supported the education of 120,000 First Nations K–12 students living on reserves across Canada. Band-operated schools located on reserves educate approximately 60 per cent of the students living on reserves, while 40 per cent go off reserve to schools under provincial authority, usually for secondary school. First Nations children living off reserve are educated in the public elementary and secondary schools in their cities, towns, and communities, with the provinces and territories providing the majority of educational services for Indigenous students. Funding is also provided for postsecondary assistance and programs for Status Indian students residing on or off reserve, as Indian and Northern Affairs Canada supports approximately 23,000 students annually for tuition, books, and living allowances. The department also provides support to some postsecondary institutions for the development and delivery of college- and university-level courses designed to enhance the postsecondary educational achievement of Status Indians and Inuit students. Every year, the Canada Student Loans Program and related provincial and territorial programs provide loans, grants, and interest forgiveness to over 350,000 postsecondary students. The Canada Millennium Scholarship Foundation awards $350 million in bursaries and scholarships each year to about 100,000 students throughout Canada. In 2009-10, the Canada Student Grant Program will replace the foundation, providing income-based grants to postsecondary students. For parents, the Canada Education Savings Grant program supplements their savings for postsecondary education. Reflecting its history and culture, Canada adopted the Official Languages Act, first passed in 1969 and revised in 1988, which established both French and English as the official languages of Canada and provided for the support of English and French minority populations. According to the 2006 Census, 67.6 per cent of the population speak English only, 13.3 per cent speak French only, and 17.4 per cent speak both French and English. The French-speaking population is concentrated in Quebec, while each of the other provinces and territories has a French-speaking minority population; Quebec has an English-speaking minority population. The federal government's official-language policy and funding programs include making contributions to two education-related components — minority-language education and second-language education. Through the Official Languages in Education Program, the federal government transfers funding for these activities to the provinces and territories based on bilateral and general agreements that respect areas of responsibility and the unique needs of each jurisdiction. The bilateral agreements related to these contributions are negotiated under a protocol worked out through the Council of Ministers of Education, Canada (CMEC). Two pan-Canadian federally funded programs, coordinated by CMEC, provide youth with opportunities for exchange and summer study to enhance their second-language skills. The Council of Ministers of Education, Canada (CMEC) was formed in 1967 by the provincial and territorial ministers responsible for education to provide a forum in which they could discuss matters of mutual interest, undertake educational initiatives cooperatively, and represent the interests of the provinces and territories with national educational organizations, the federal government, foreign governments, and international organizations. CMEC is a collective voice for education in Canada and, through CMEC, the provinces and territories work together on common objectives in a broad range of activities at the elementary, secondary, and postsecondary levels.